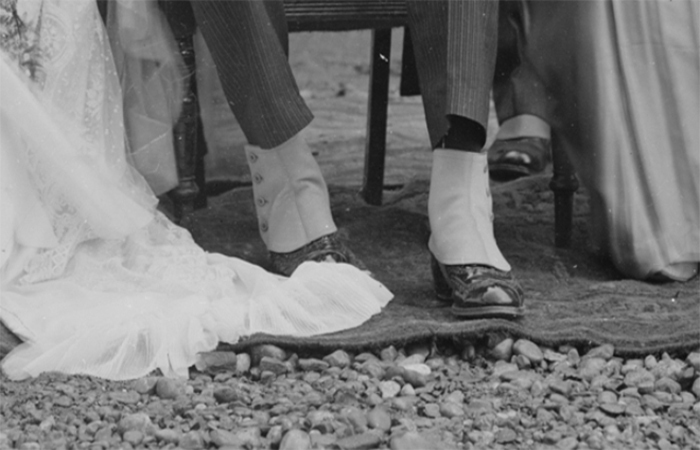 Who was the last man in Britain to wear spats? Was it perhaps Lord David Cecil, that gauche-seeming Oxford don who spoke in shrill Edwardian cadences, and – if memory serves – displayed an anachronistically spatted foot on television? If so, how right that the last spats-wearer should have been a lord. Once a status symbol, spats have for long been little more than a running joke in the works of P G Wodehouse. His Young Men in Spats was published in 1936, when spats were already as rare as the collapsible top hat. In Oxford Dictionary terms, spats were ‘a form of short gaiter worn over the instep and reaching only a little way above the ankle, usually fastened under the foot by means of a strap’. They had four buttons down the side. Webster’s Dictionary says they were worn ‘for protection or appearance’. They were a supremely useless garment, but that did not prevent Lord Reith of the BBC wearing them. There is a glorious photograph of a white-spatted, top-hatted Reith towering above a scruffy-shifty Prime Minister (Ramsay MacDonald). Spats were descended from spatterdashes, a kind of long leggings to keep trousers or stockings from being mud-spattered. As such, well pipe-clayed, they formed part of military uniform. In mid-Victorian times, with trousers as we know them well established, and with less mud on fashionable streets, leggings became redundant, other than for sporting wear. However, sartorial taste ruled that, as shirts needed cuffs, so did trousers, the legs of which ought not to break directly on the shoe. The only ‘protection’ they afforded was against puppy bites, but the flash of white, pearl, grey or lavender at the ankle lent, as it were, a polite footnote to the figure. Vanity Fair’s gallery of late Victorian and Edwardian swells shows Winston Churchill, Arthur Balfour and Thomas Hardy all wearing spats in formal attire, and the caricaturist ‘Ape’ is himself portrayed as a portly spatted figure who must have had trouble in reaching those eight buttons unaided. In After Hours With P G Wodehouse Richard Usborne recalls the strange story of the German spy who in 1942 was reputedly dropped near Dartmoor and was denounced as a suspicious character because he was wearing spats, having been kitted out by German intelligence in what was thought to be the correct attire for an upper-class Englishman. Usborne suggests that Hitler’s interpreter, Dr Paul Schmidt, a devotee of Wodehouse, was possibly the brains behind this howler. Whatever the truth, it is a pretty story and makes a change from those tales of parachuted nuns wearing German field boots. During World War Two British soldiers were issued with a little-loved form of spats known as ‘anklets, web’, into which the legs of battle-dress trousers were tucked. Failure to wear ‘anklets, web’ could result in a spell of cookhouse fatigues, or worse.